The other day, I had the displeasure of reading a blog post that should cause offence to anyone with half a brain. Now, I’m all for freedom of speech, and one of the reasons I’m based in Hong Kong and not in Singapore is because the press here is relatively free. But how this post, which was published on the news site The Real Singapore, is allowed to exist in the public domain in a country with fiercely strict laws is a mystery to me. Ok so at a very technical/ genetic level, they are humans. But I am not talking technically here. My point is they are not the ‘same kind’ of humans we are. They have different cultural and moral bearings and these differences need to be acknowledged so that we can decide how to deal with this group of people. The post makes for ugly reading. So to save you the trouble, it goes on to argue – in bewilderingly ignorant fashion – how Indians and Bangladeshis have limited thinking ability, don’t value human life, are corrupt and mistreat women. If there is an article that is likely to incite racial hatred, at a time when racial tensions between locals and foreigners in Singapore are hardly rosy, just three days after the most violent riots in 40 years, it is this one. Does this post not breach Singapore’s Sedition Act? Subsection 3 of the Act describes the types of publication that have seditious tendency and these include publication that ”promote feelings of ill-will and hostility between different races or classes”. Singapore takes social cohesion and racial harmony in the country seriously because of its multi-cultural makeup. About 40 per cent of the population are foreigners, the sixth-highest percentage in the world. In 2009, 74.2% of residents were of Chinese, 13.4% of Malay, and 9.2% of Indian descent, while Eurasians and other groups form 3.2%. Also contributing to the nation’s sensitivity on racial harmony is its history of racial riots in the 1960s. More recent events of racial violence in neighbouring Indonesia in the late 1990s and early 2000s also serve as reminders of potential inter-racial conflicts in the region. Thankfully, in the comment thread beneath the piece, many posters give the author – who by the way does not give his/her real name – short thrift. The issue here is that Singapore’s media regulator, the Media Development Authority, has recently introduced a tough new licensing regime for online news reporting, but no one is really clear what these rules are for, nor what they mean. I would humbly suggest, MDA, that if you have laws against such reporting, you actually do something about it. Is this article not trampling all over Singapore’s famous OB markers – and at the worse time, possibly in the country’s short history? The disclaimer at the beginning of the post is a cowardly cop-out. It may well have been the property of the contributor when he or she wrote it. But it is yours now. Because you have published it on your website. A follow-up post by the same author which has since been added to the original is equally vile and misguided. This week the licensing regime claimed its latest victim – the Breakfast Network – which closed on Tuesday because it refused to sign MDA’s forms. The Independent, which launched in August, was also leant on by the regulator — even before its launch. The MDA claimed that it is worried the foreigners are interested in funding the website. In its shareholders agreement signed in April, The Independent has made it explicitly clear that it won’t take foreign money. The site has gone ahead to sign the forms. 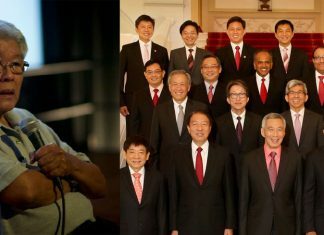 MDA, perhaps, in this case, you should be leaning on The Real Singapore too?